Hooray for a resurgence of popularity for Lucy Maud Montgomery's beloved character, Anne Shirley. 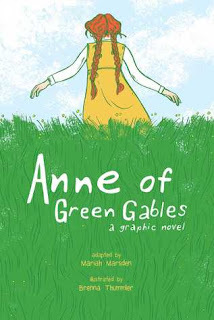 Netflix has a series, "Anne with an E" chronicling the life of our favorite Prince Edward Isle redhead, and now there is a graphic novel about her misadventures. Mariah Marsden's adaptation of the novel has all the beloved quotes from the novel, but operates at a surface level. This is one of the risks of adapting a massive tome into a graphic novel: the details must be left out. The raspberry cordial incident lasts only a few pages and walking the roof's ridgepole is even shorter. 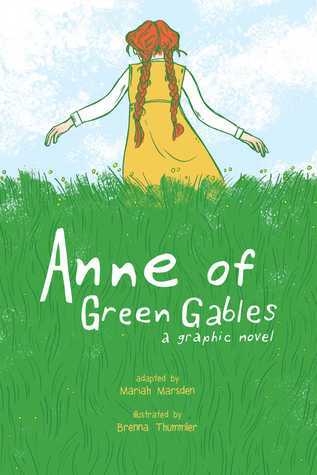 I hope that the graphic novel serves as a gateway to the original works for readers, as there is so much more to Anne's mishaps. The color palette selected by illustrator Brenna Thummler is beautiful and the nature scenes capture the Green Gables of my imagination. I wish that the people were a bit better looking; Diana Barry was always supposed to be attractive and that doesn't translate in this version. For my money, the Netflix series is a preferable adaptation. It makes sense, as they have so much more time to tell stories, but they also do a better job of demonstrating how bonkers Anne Shirley truly was.